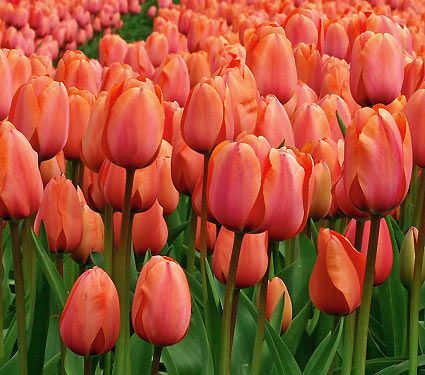 Even with intense competition from the glories of Azaleas, Lilacs and Dogwoods, Tulips are the grandest stars of April and May. Their rich and varied colors, silky petals, and elegant forms make them one of the most valuable of ornamental plants. 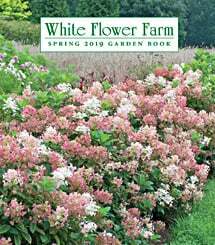 From the perky open-faced stars of the low-growing species to the long-stemmed, glowing chalices of the Darwin Hybrids, there is a look for every garden and every moment of spring, regardless of color scheme or garden style. 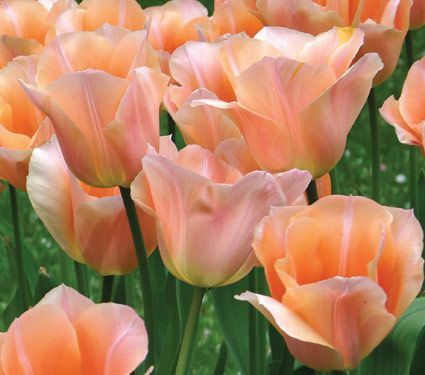 The Darwin Hybrids produce long-lasting flowers on strong stems that are perfect for cutting, and the brilliant colors of these very popular Tulips show up beautifully in the landscape. 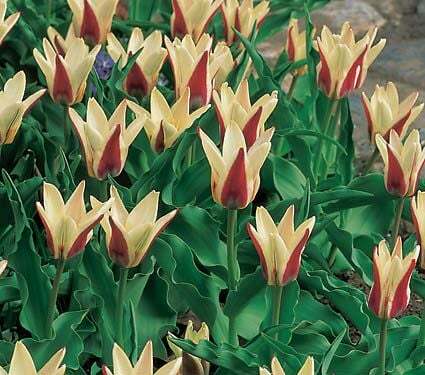 Darwin Hybrids usually perform well for several years, making them among the best perennial Tulips. They bloom in midseason, along with all but the earliest Daffodils, and they force well. Wind and weather resistant. 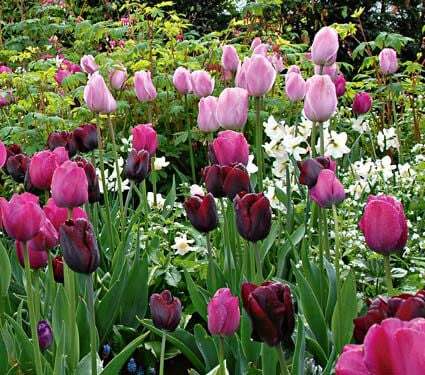 The Triumphs make up the largest group of Tulips and the one that offers the widest range of colors. All have medium-length stems. Triumphs are best used for forcing and short-term bedding. They are also good in containers, if protected from freezing in areas colder than Zone 7. Long-lasting, semidouble to double flowers that bear a striking resemblance to double Peonies. All are good for bedding, and some are excellent candidates for forcing. Early varieties bloom with Daffodils, Muscari, and Hyacinths. The shorter, earlier varieties are also great in pots, planters, and window boxes (if protected from freezing in Zones colder than 7). 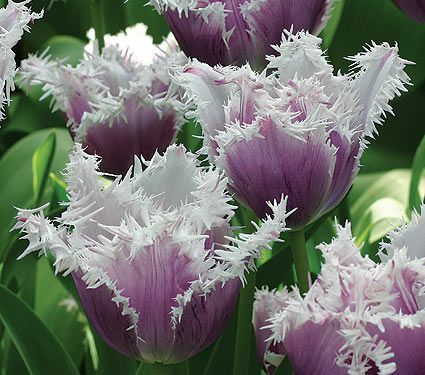 Also know as "Crispa" Tulips. The flower petals are edged with very finely cut fringes. Fringed Tulips make unusual bedding plants. Midseason to late blooming. The Fosterianas have exceptionally large, long flowers in rich colors that create vivid displays. This group is very popular for landscaping in Europe but not as familiar in the United States. 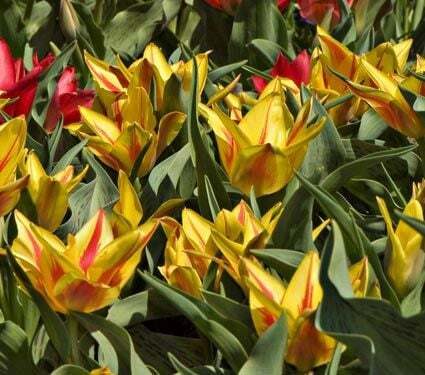 It's worth the effort to get to know these Tulips because they are among the best for perennializing and naturalizing, as well as for forcing. They bloom early with Daffodils, whose warm yellows and oranges harmonize especially well with the hot-colored selections in this group. Try underplanting with blue Muscari or purple Pansies for maximum contrast. 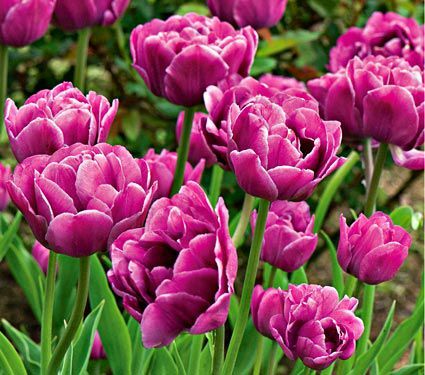 These are reliably perennial Tulips with lovely purple-mottled or purple-striped foliage that is attractive before the flowers open and remains so even after they are gone. The chalice-shaped flowers generally open wide to reveal the interior colors. These exceptionally brilliant Tulips are much loved in Europe for creating vivid but compact displays. Early to midseason bloomers, these are perfect companions for midseason Daffodils, Anemones, and Hyacinths. Greigii Tulips are good for bedding and for forcing. 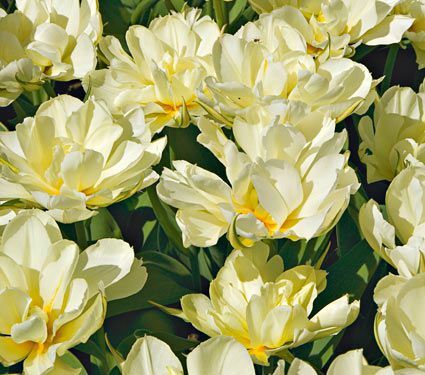 These are long-lived perennial Tulips that bloom very early, with early and midseason Daffodils. The flowers of most varieties open wide like a star or water lily. Some have mottled or striped foliage. Because they are compact growers, Kaufmannianas are good for rock gardens and the edges of borders. They are also suitable for pots, window boxes, and patio planters (if kept from freezing in Zones colder than 7). 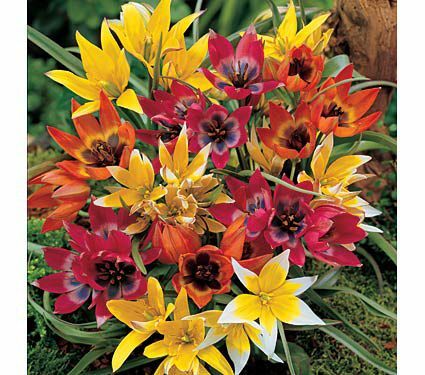 Very graceful and elegant flowers with pointed, reflexed petals, creating a distinctive profile. These late bloomers are excellent for bedding and cutting. Feathery-edged blooms are heavily fringed and scalloped. Parrots make stunning cut flowers that are sure to provoke admiration. 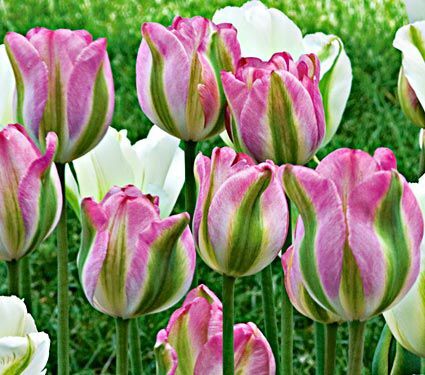 These showy Tulips are often depicted in European floral paintings. Because they so big and full, they need protection from wind and heavy rain. 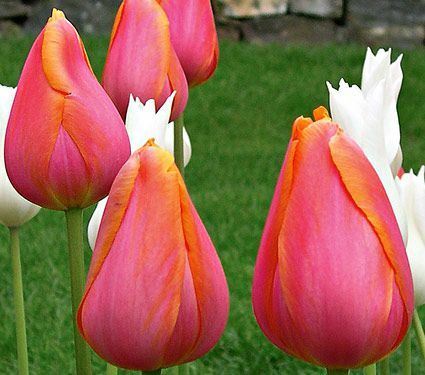 Most are mutations from Single Late and Triumph Tulips. 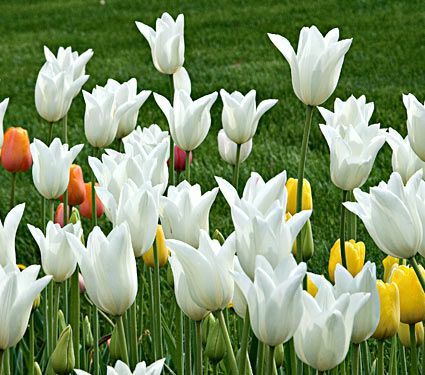 These single-flowered cultivars are among the earliest Tulips to bloom, often with Daffodils. Because they open in cooler weather, the flowers usually last longer than those of later Tulips. They are perfect complements for Hyacinths, Violas, Forget-me-nots, and Pansies. Excellent for forcing, Single Early Tulips are also great for bedding and planting in containers (if pots are protected from freezing in Zones colder than 7). These late bloomers are good for bedding and cutting. Try them under a flowering Crabapple. We've separated these robust Tulips from the other single lates because they tend to grow taller. They are very strong perennials and have distinctively oblong-shaped flowers, which are long-stemmed and long-lasting. As you might imagine, they're great for cutting. Because the bulbs mature earlier, they also perform well in warmer climates. 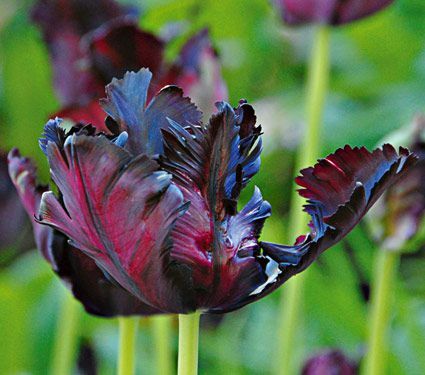 These Tulips are often considered a novelty because they are unusual, but connoisseurs treasure their refined beauty. As the name suggests, their flowers are green, often in combination with a second, complementary color. Both varieties offered are long blooming and look simply spetacular in flower arrangements. Late blooming. These diminutive beauties harken back to the very first Tulips, the little bulbs that have given rise to all the big showy hybrids. If given good drainage, the Species come back year after year; they're by far the best Tulips for naturalizing. They are also excellent for rock gardens, the front of borders and forcing, and they are good for containers if protected from freezing in Zones colder than 7. Most are suitable for heirloom gardens.